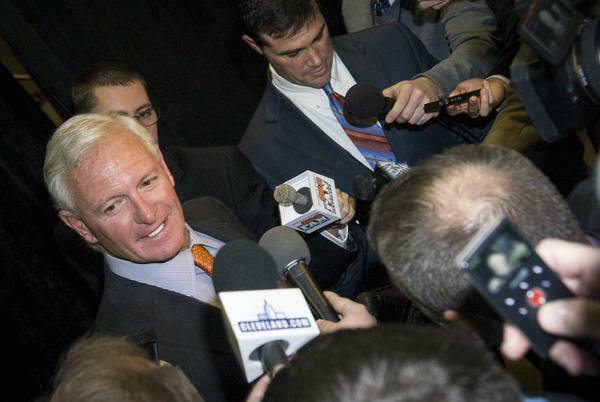 Browns owner Jimmy Haslam saved The Columbus Crew from relocating to Austin, which will likely boost his reputation. "When he stepped in to buy The Crew, he comes in with a very high powered group of guys to save this franchise," Pluto said. Pluto is referring to new Crew President Tim Bezbatchenko and head coach Caleb Porter, who both have ties to Ohio and have won national cups. Bezbatchenko is from Westerville, Ohio, and was the general manager of Toronto FC when they won the MLS cup in 2017. Porter, meanwhile, was head men's soccer coach at the University of Akron from 2006-12, where he led the Zips to the 2010 NCAA championship. He then coached the MLS Portland Timbers to a cup in 2015. Porter stepped down in 2017. "This is almost a dream scenario if you're buying a franchise to try to revive it," Pluto said. "In six years [at Akron], there were 17 players that Caleb Porter coached who went to the Major League Soccer draft," Pluto said. "He isn't just a great soccer coach but has the reputation around here to help sell some tickets." The Columbus Crew ranked last in attendance in 2018. Pluto says buying The Crew likely will help boost Haslam's reputation, which had taken a hit in the years that he's owned the Browns. "He came in [to the Browns] and really didn't seem to have a big plan to get a coach, and I think Haslam thought it was going to be a lot easier than it was. I think actually The Crew will benefit from a lot of the mistakes that he made early." Pluto says Haslam's reputation also suffered during the rebate fraud surrounding his other company, Pilot Flying J. About a dozen top executives pleaded guilty to skimming money from trucking companies for at least five years. Jimmy Haslam was not implicated. Pluto says acquiring The Crew will help Haslam expand the Browns' fan base. For years, Haslam has been trying to do that by moving training camp to Columbus. Pluto thinks that could still happen, as the Haslams are building a $230 million stadium for The Crew. "If you're just a casual fan from a business/sports standpoint to see if Haslam pulls this off, because he got the right GM in John Dorsey with the Browns and they began to turn it around. Will The Crew follow that? And Haslam's reputation could completely change." Columbus Crew fans got to meet the team's new owners and coach for the first time Wednesday. The Columbus Crew has named Tim Bezbatchenko as its new president and Caleb Porter as head coach. The Crew has been saved. Major League Soccer announced Friday that it reached an agreement with investors to purchase and take control of the Columbus Crew beginning next month. Update: MLS announced it has reached a deal to sell the Columbus Crew. Read the full story here. Columbus Attorney Zach Klein says the city and state have dismissed their lawsuit against Major League Soccer and Precourt Sports Ventures, amid negotiations over purchasing the Columbus Crew.